A quick weekend getaway, while exciting because it breaks the routine, should also have some comforting elements as well. On a recent jump down to Philadelphia, that’s exactly what I had in mind. And while TSA restrictions didn’t apply, I’ve gotten so used to packing that way, all of my grooming necessities were airline appropriate. Pictured above – my outfit for the drive down. Shirt: L.L. Bean Flannel shirt. I used to laugh at my dad when he bought these but not anymore. It’s extremely comfortable and has become my go-to weekend shirt of choice. Pants: Ralph Lauren Cargo Pants – Slimmer versions are trending but these are just loose enough to keep the look mature and not frat boyish. Cologne: Travel size bottle of Bois Blonds by Atelier Cologne – Choosing just one scent to take on a trip is never easy for me. That might sound extra but I’m sticking with it. What I love about Bois Blond is its versatility. It can easily go with this outfit, which is tastefully relaxed, and be used for an evening out when you feel like dressing it up, which was the case when I went to an awesome Tapas place in Philadelphia called Amada. Razor: I’ve recently given the straight razor shaving thing a try. The team at Retrorazor sent me a starter kit a long time ago but I’m just getting around to using it. It’s a safety razor, which is great for someone like myself who’s just beginning and it looks awesome…so chic. I decided to take it with me since I’d have some time on my hands and I’m really enjoying the leisure of straight shaving. Pouch: eshave on the go travel kit (includes pre shave oil, shaving cream and moisturizer). Since I started straight shaving, I’ve taken the opportunity to try new products and eshave is my latest test. Since they don’t offer any samples at its store here in NYC, which is normally a deal breaker for me, I decided the next best thing was trying the travel size. I’m glad I did it. The product is great and its scent nicely adds to the experience. At the end of the day, comfort is what you make it. Enjoy your break from the mundane, that’s what the weekend getaway is for. With smart choices, however, you don’t have to abandon some of your routines that bring you comfort. This entry was posted in Grooming and tagged Atelier Cologne, best cologne, Converse, eshave, Grooming, Jack Purcell, Land's End, men's cologne, Men's Fragrances, mens top fragrances, Packing advice, Packing Tips, Ralph Lauren, Weekend Getaway, Weekend Trips, Wurkin Stiffs. Bookmark the permalink. 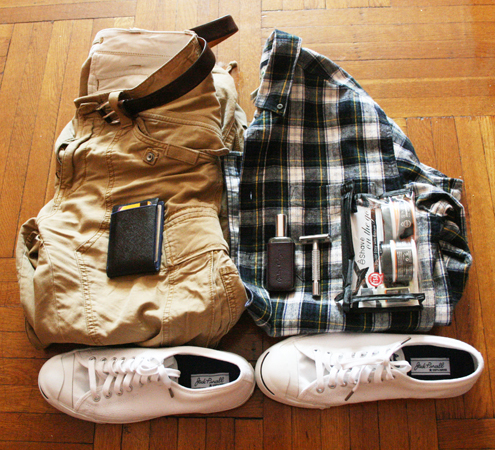 Great looking weekend kit…so how was the shave? Checking out the Wurkin Stiffs gear now.